The Rotary Foundation, charitable arm of Rotary, has been named the 2016 Outstanding Foundation by the Association of Fundraising Professionals (AFP). “While almost everyone is familiar with Rotary, not everyone may realize just how much an impact Rotary and the Rotary Foundation have had on countless people and communities across the globe,” said interim AFP President and CEO Jason Lee in a press release. The foundation has seen assets grow from an initial $26.50 donation nearly a century ago to $1 billion today, with more than $3 billion spent on various initiatives. The Rotary Foundation has made the global eradication of polio its top priority over the decades. Beginning with the launch of the PolioPlus program in 1985, the foundation has contributed more than $1.6 billion to fighting the crippling disease and has advocated governments and other foundations to contribute an additional $9 billion to the cause. Polio is currently on the verge of becoming just the second human disease to be eradicated, after smallpox, with a 99.9 percent decrease in cases since PolioPlus launched. Other foundation priorities have included addressing hunger, poverty, illiteracy and peace. The foundation launched the Rotary Peace Fellows program in 2002, providing up to 100 fellows per year the opportunity to participate in a master’s degree or certificate program at one of Rotary’s Peace Centers. The foundation will formally receive the award in the spring during AFP’s 2017 International Fundraising Conference in San Francisco, Calif., on April 30 through May 2. The recognition comes while the foundation is in the process of preparing for its centennial year. 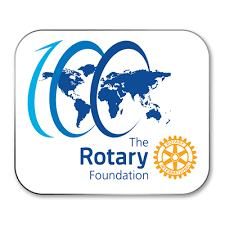 The Rotary Foundation plans to ring in 100 years by raising $300 million by July.